What is financial stability & independence? To the community, when assessing what is meant by ‘financial stability’, it’s a marker of independence and freedom. Financial independence on the other hand, can be linked to the transition period between living off student loans and no longer having to rely on parents for a sole income. The community felt as though financial independence would even relieve anxieties and enable them to do the activities they wanted. Whilst financial independence alluded freedom and a marker of coming of age, financial stability outlined a time of safety, security and being debt free. The community were asked how they would define what financial stability is. For most of the community they defined financial stability as ‘I don’t have to worry about when I’ll next receive money e.g. my next pay check’. Reinforcing, how financial stability resonates as a period of relief and a comfortable lifestyle. 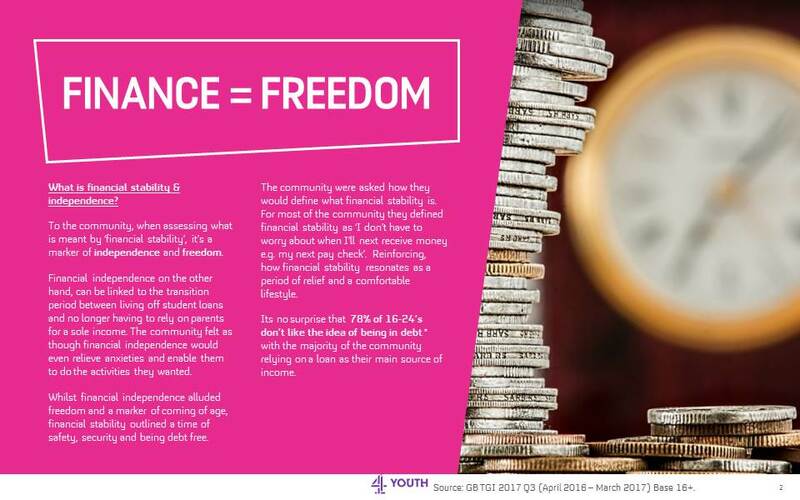 Its no surprise that 78% of 16-24’s don’t like the idea of being in debt* with the majority of the community relying on a loan as their main source of income. Source: GB TGI 2017 Q3 (April 2016 – March 2017) Base 16+. A glance at how the community feel about the future of payment platforms, and the different factors they take into consideration. As of recent (July 2017), for the first time ever, card payments have become the top payment method, accounting for more than half of all retail purchases. Whilst card payments are the preferred option for Tribes, when asked in 2016, they were hesitant to changing towards a contactless payment future. The reluctance towards a contactless card society was particularly focused around contactless payments made by mobile devices. Many , expressed concern over fraud related issues regarding the payments. They also feel apprehensive about losing or having their phone stolen, with worries around both their phone and bank details being stolen. The fear of fraud, prevented Tribes from using contactless payments. On the positive side, Tribes were quick to point out the ease and accessibility that contactless payments posed. They also recognised the added benefits it could bring to them, such as having the phone as a back up should they forget money or card, which did appeal to young people. 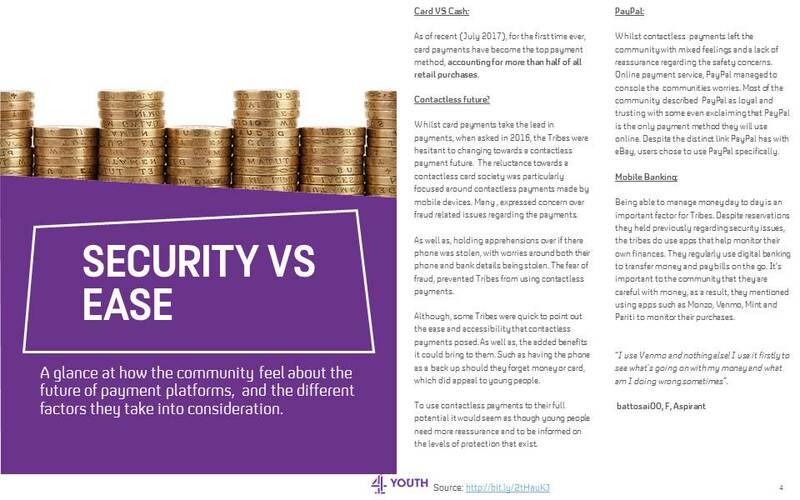 To use contactless payments to their full potential it would seem as though young people need more reassurance and to be informed on the levels of protection that exist. Whilst contactless payments left the community with mixed feelings and a lack of reassurance regarding the safety concerns. Online payment service, PayPal managed to console the communities worries. Most of the community described PayPal as loyal and trusting with some even exclaiming that PayPal is the only payment method they will use online. 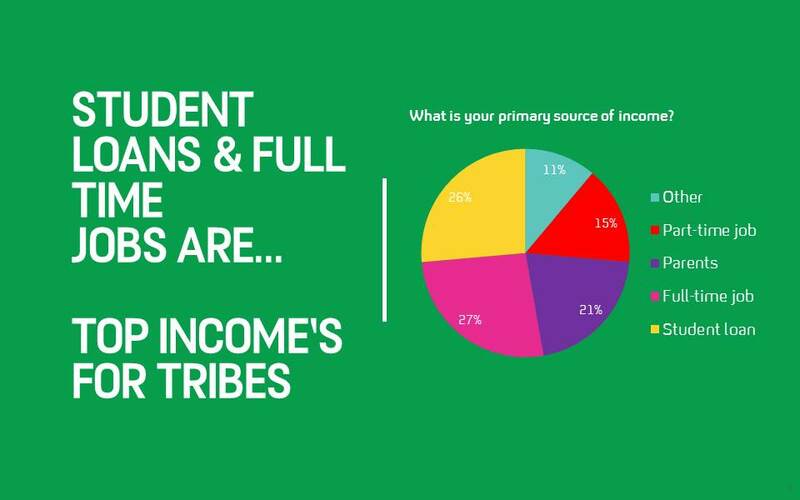 Being able to manage money day to day is an important factor for Tribes. Despite reservations they held previously regarding security issues, the tribes do use apps that help monitor their own finances. They regularly use digital banking to transfer money and pay bills on the go. It’s important to the community that they are careful with money, as a result, they mentioned using services such as Monzo, Venmo, Mint and Pariti to monitor their purchases. “I use Venmo and nothing else! I use it firstly to see what’s going on with my money and what am I doing wrong sometimes”. 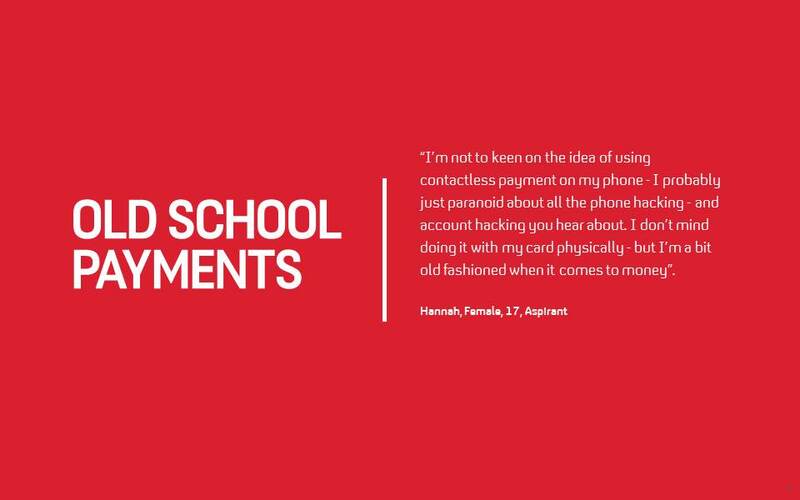 “I’m not to keen on the idea of using contactless payment on my phone – I probably just paranoid about all the phone hacking – and account hacking you hear about. I don’t mind doing it with my card physically – but I’m a bit old fashioned when it comes to money”. 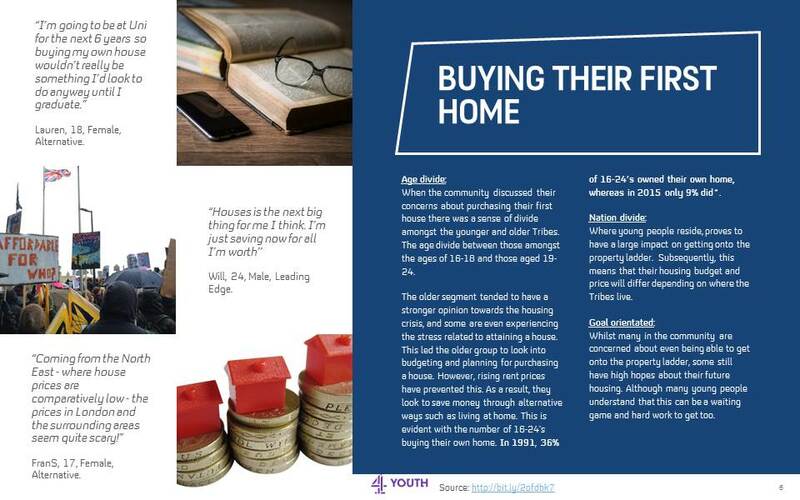 Age divide: When the community discussed their concerns about purchasing their first house there was a sense of divide amongst the younger and older Tribes. The age divide between those amongst the ages of 16-18 and those aged 19-24. The older segment tended to have a stronger opinion towards the housing crisis, and some are even experiencing the stress related to attaining a house. This led the older group to look into budgeting and planning for purchasing a house. However, rising rent prices have prevented this. As a result, they look to save money through alternative ways such as living at home. This is evident with the number of 16-24’s buying their own home. In 1991, 36% of 16-24’s owned their own home, whereas in 2015 only 9% did*. Nation divide: Where young people reside, proves to have a large impact on getting onto the property ladder. Subsequently, this means that their housing budget and price will differ depending on where the Tribes live. Goal orientated: Whilst many in the community are concerned about even being able to get onto the property ladder, some still have high hopes about their future housing. Although many young people understand that this can be a waiting game and hard work to get too. – Lauren, 18, Female, Alternative. – Will, 24, Male, Leading Edge. – FranS, 17, Female, Alternative. When the Tribes were asked what they’d do if they were to win £1M, many prioritised paying of university debt and buying a house so they could get onto the property ladder. Although, coming out highest was putting an amount of the funds into a savings account or investing a sum of money in order to make more money, young people are in fact 16% more likely than the average adult to say they look for profitable ways to invest their money*. The community discussed what apps they’d create if they could. Tribes were quick to mention apps that would add simplicity and convenience to their life’s. A few mentioned how they would create apps that simplified the job process. The community use a range of mobile apps to help monitor their finances and ensure they are analysing their spending habits. Reinforcing the discerning attitude of todays youth. The Tribes mentioned apps such as Monzo, Pariti, and Chip as tools to help them track purchases. Here at Channel 4, we created the Updated Upmarket’s and found the most valuable audience to advertisers, is the Proactive’s. 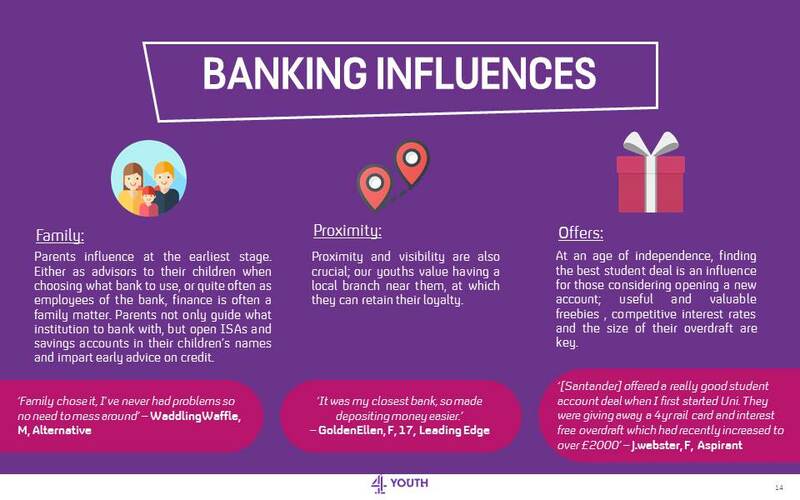 16-24’s from the Proactive segment are 64% more likely to say they’re interested in financial services advertising. The Proactive audience are the forward thinkers, early adopters and commercially receptive audiences. There are 762K proactive 16-24’s in the UK, and they are 127% more likely to watch E4 than the average adult*. 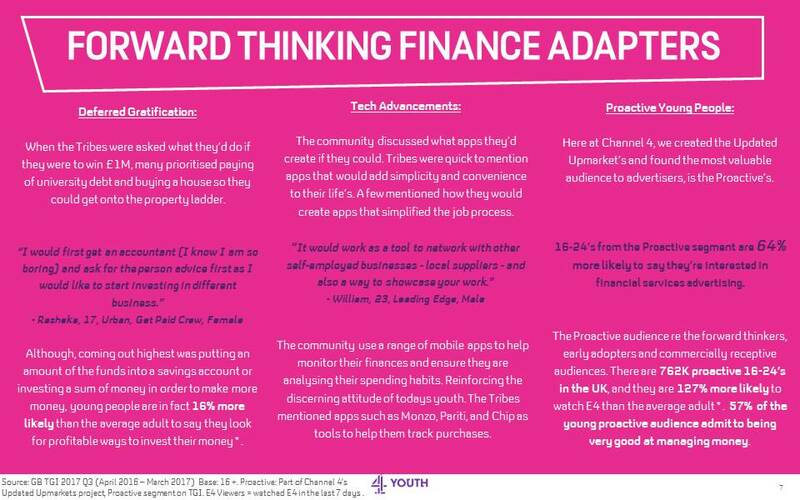 57% of the young proactive audience admit to being very good at managing money. Source: GB TGI 2017 Q3 (April 2016 – March 2017) Base: 16 +. Proactive: Part of Channel 4’s Updated Upmarkets project, Proactive segment on TGI. E4 Viewers = watched E4 in the last 7 days. 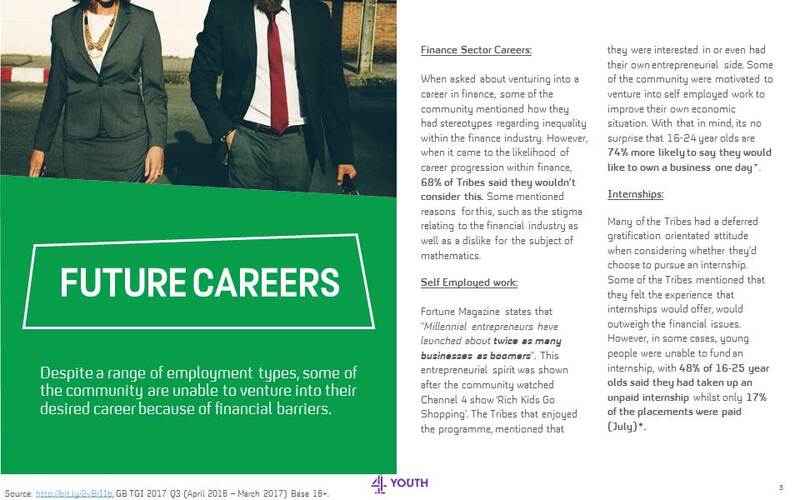 Despite a range of employment types, some of the community are unable to venture into their desired career because of financial barriers. 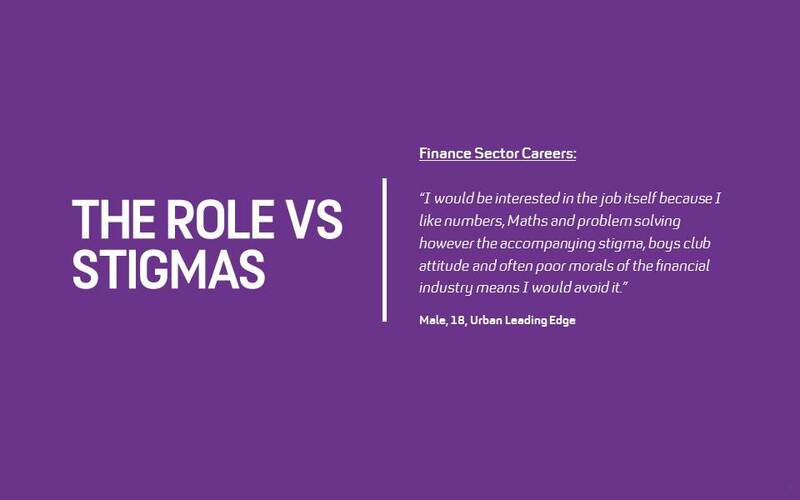 Finance Sector Careers: When asked about venturing into a career in finance, some of the community mentioned how they had stereotypes regarding inequality within the finance industry. However, when it came to the likelihood of career progression within finance, 68% of Tribes said they wouldn’t consider this. Some mentioned reasons for this, such as the stigma relating to the financial industry as well as a dislike for the subject of mathematics. Self Employed work: Fortune Magazine states that “Millennial entrepreneurs have launched about twice as many businesses as boomers“. This entrepreneurial spirit was shown after the community watched Channel 4 show ‘Rich Kids Go Shopping’. The Tribes that enjoyed the programme, mentioned that they were interested in or even had their own entrepreneurial side. Some of the community were motivated to venture into self employed work to improve their own economic situation. With that in mind, its no surprise that 16-24 year olds are 74% more likely to say they would like to own a business one day*. Many of the Tribes had a deferred gratification orientated attitude when considering whether they’d choose to pursue an internship. Some of the Tribes mentioned that they felt the experience that internships would offer, would outweigh the financial issues. 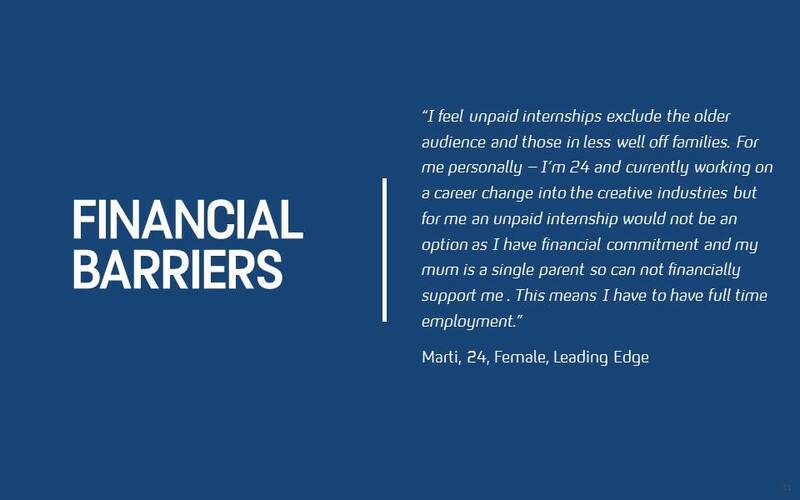 However, in some cases, young people were unable to fund an internship, with 48% of 16-25 year olds said they had taken up an unpaid internship whilst only 17% of the placements were paid (July)*. Source: http://bit.ly/2vBrIIb, GB TGI 2017 Q3 (April 2016 – March 2017) Base 16+. 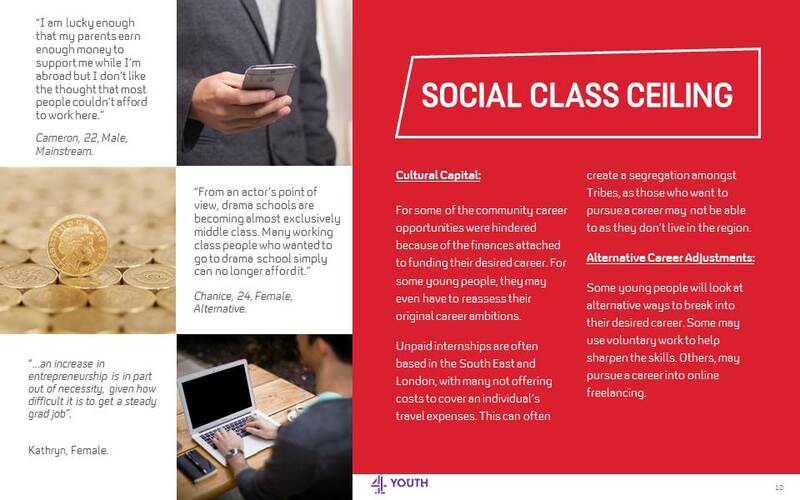 Cultural Capital: For some of the community career opportunities were hindered because of the finances attached to funding their desired career. For some young people, they may even have to reassess their original career ambitions. Unpaid internships are often based in the South East and London, with many not offering costs to cover an individual’s travel expenses. This can often create a segregation amongst Tribes, as those who want to pursue a career may not be able to as they don’t live in the region. Some young people will look at alternative ways to break into their desired career. Some may use voluntary work to help sharpen the skills. Others, may pursue a career into online freelancing. – Cameron, 22, Male, Mainstream. “…an increase in entrepreneurship is in part out of necessity, given how difficult it is to get a steady grad job”. The community acknowledge it is crucial to be prepared for the future financially, but feel that they lack the skillset to do so. 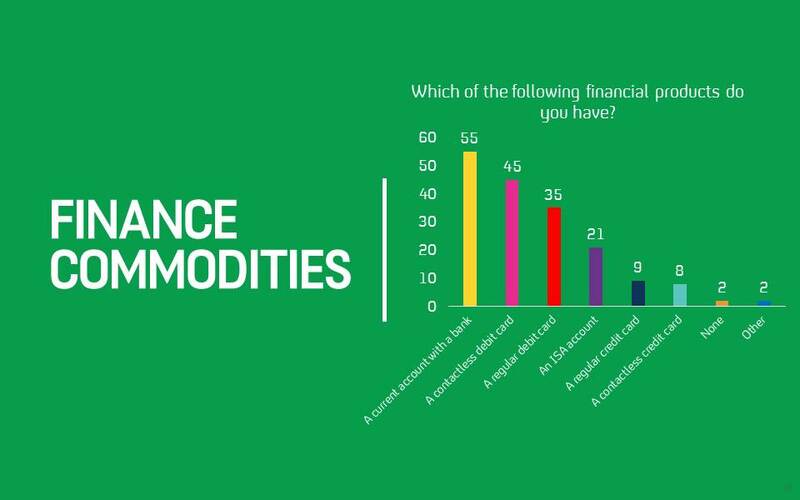 When asked, the community exclaimed how they had awareness of some financial products, for example 1 in 4 of the community own a credit card. However, when it came to their thoughts around the product, there were some strong opinions. Despite the fact, that just under a third own an ISA account, this was more often than not influenced by family members. 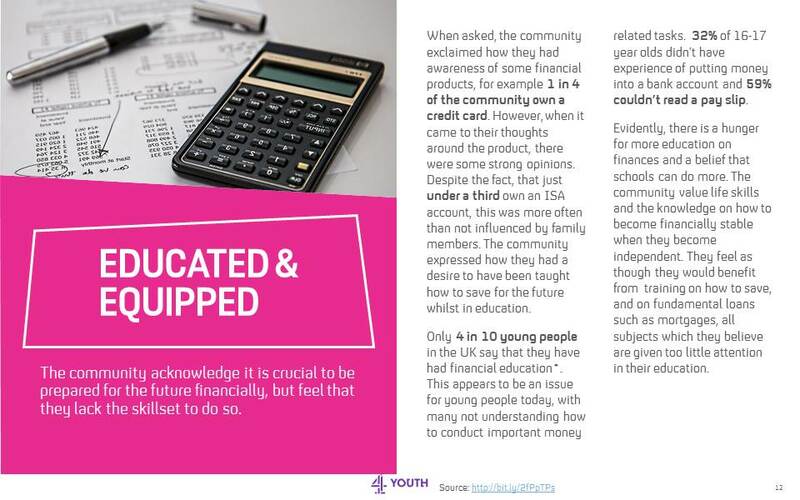 The community expressed how they had a desire to have been taught how to save for the future whilst in education. 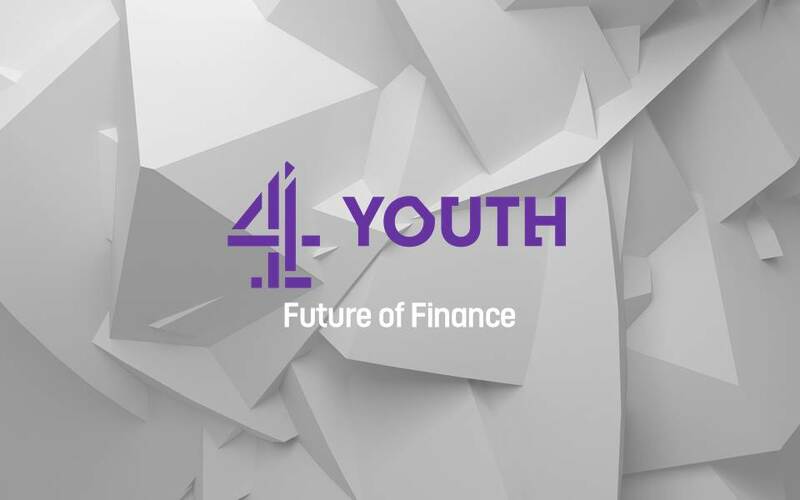 Only 4 in 10 young people in the UK say that they have had financial education*. This appears to be an issue for young people today, with many not understanding how to conduct important money related tasks. 32% of 16-17 year olds didn’t have experience of putting money into a bank account and 59% couldn’t read a pay slip. Evidently, there is a hunger for more education on finances and a belief that schools can do more. The community value life skills and the knowledge on how to become financially stable when they become independent. They feel as though they would benefit from training on how to save, and on fundamental loans such as mortgages, all subjects which they believe are given too little attention in their education. Parents influence at the earliest stage. Either as advisors to their children when choosing what bank to use, or quite often as employees of the bank, finance is often a family matter. Parents not only guide what institution to bank with, but open ISAs and savings accounts in their children’s names and impart early advice on credit. Proximity and visibility are also crucial; our youths value having a local branch near them, at which they can retain their loyalty. At an age of independence, finding the best student deal is an influence for those considering opening a new account; useful and valuable freebies , competitive interest rates and the size of their overdraft are key. 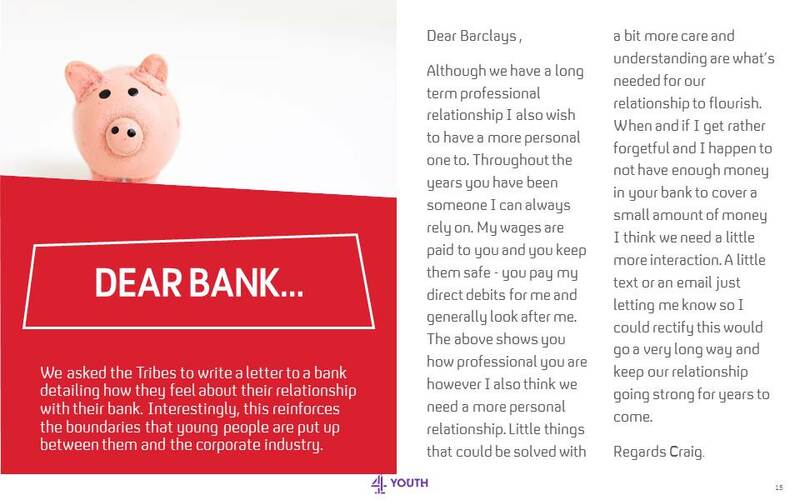 We asked the Tribes to write a letter to a bank detailing how they feel about their relationship with their bank. Interestingly, this reinforces the boundaries that young people are put up between them and the corporate industry. Although we have a long term professional relationship I also wish to have a more personal one to. Throughout the years you have been someone I can always rely on. My wages are paid to you and you keep them safe – you pay my direct debits for me and generally look after me. The above shows you how professional you are however I also think we need a more personal relationship. Little things that could be solved with a bit more care and understanding are what’s needed for our relationship to flourish. When and if I get rather forgetful and I happen to not have enough money in your bank to cover a small amount of money I think we need a little more interaction. A little text or an email just letting me know so I could rectify this would go a very long way and keep our relationship going strong for years to come. For the community, they acknowledge that there is a difference between financial independence and stability. Financial independence is a short term goal whereas financial stability is a longer term goal they hope to achieve. However, in order to establish these goals the community need to overcome the financial barriers getting there. From breaking into the industry with a lack of income to a misunderstanding of how to do everyday business activities. Its conclusive that the community feel as though they need to learn more to prepare them for the future financially, ensuring they are all given an equal chance. 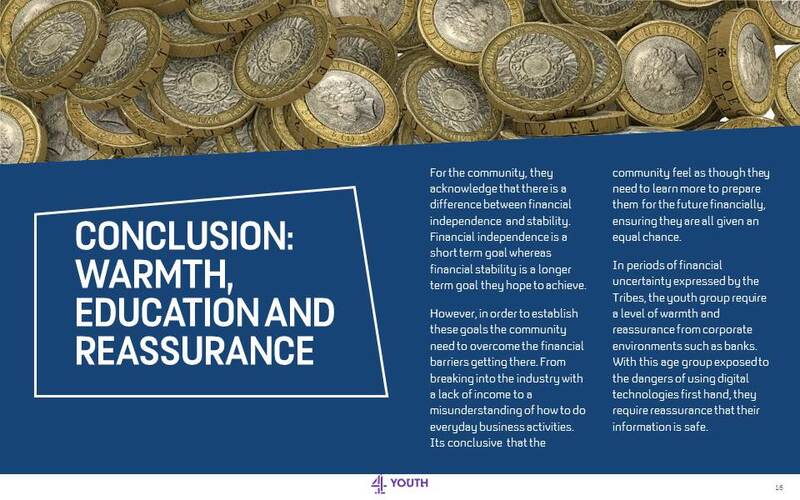 In periods of financial uncertainty expressed by the Tribes, the youth group require a level of warmth and reassurance from corporate environments such as banks. With this age group exposed to the dangers of using digital technologies first hand, they require reassurance that their information is safe.